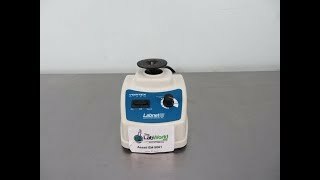 The Labnet Vortex Mixer S0200 provides every day vortex mixing in a sturdy easy to use compact foot print. This vortexer has an adjustable speed range up to 3400 RPM for gentle to vigorous shaking of samples. The Labnet S0200 Vortex Mixer can also operate in either touch or continuous mode. The wide base and rubber feet prevent the labnet vortexer from walking while in operation, with a counterbalanced motor system to help avoid vibration. This Labnet Vortex Mixer S0200 has been fully inpsected and is performing to expectations. All of our lab equipment comes backed with our standard warranty. Should you have any questions, please don't hesitate to contact us.